Stop snoring today with Theravent! 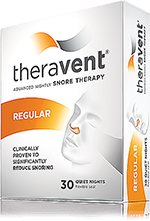 Theravent Snore Therapy delivers the quiet night's sleep you have been waiting for in the form of a lightweight adhesive strip worn comfortably over the nostrils during sleep. They are easy to place and once situated, you will barely even notice their presence. Unlike more intrusive measures, we have made it simple and convenient to get effective treatment without making radical changes to your sleep habits and night time routine. This is particularly important for people who share a bed. Sometimes the treatment is as disruptive to the other person as the original affliction and can cause more problems. With Theravent nasal strips the only thing they will notice is your easy breathing and uninterrupted sleep. Theravent's revolutionary snoring aid has been proven effective in clinical studies to reduce or eliminate snoring by up to 70%. For most people, Theravent’s effects will provide the relief they need to get a good night’s sleep and help those around them as well. 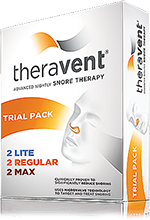 Available in 3 strengths, Theravent nasal strips offers a solution for every snorer from light to loud. 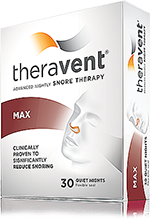 What differentiates Theravent from other snoring aids? Unlike other snoring aids, Theravent uses the power of the wearer's own breath to target the most common cause of snoring - vibration in the airway. This vibration occurs when throat muscles relax during sleep and obstruct the airway. Air rushing past the soft tissue creates the vibrations that result in the sound we know as snoring. 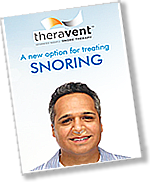 Theravent uses patented MicroValve technology and Expiratory Positive Airway Pressure, or EPAP, to remedy snoring. Upon exhalation, the MicroValves partially close to create a gentle pressure that maintains an open and clear airway, reducing snoring and night time irritations. Theravent is the result of many years of research, development and testing. It has been designed to give more people the relief they need to lead happy, healthy lives and enjoy satisfying, uninterrupted sleep night after night. Invented by a Stanford University professor of medicine, Theravent Advanced Nightly Snore Therapy’s impact on snoring and on bed partners’ sleep has been rigorously tested in clinical studies. Results were presented at the Associated Professional Sleep Societies conference, the prestigious medical conference sponsored by the American Academy of Sleep Medicine, and published in Sleep Diagnosis and Therapy. These studies proved that Theravent was effective in reducing snoring. 3 out of 4 bed partners in the studies also reported that they got a better night’s sleep when their partner used Theravent. 83% of bed partners said their partners snored less with Theravent snoring strips. With Theravent REGULAR 79% of bed partners said that Theravent Advanced Nightly Snore Therapy delivered a quieter night’s sleep; and with Theravent MAX an astonishing 89% of bed partners reported a quieter night's sleep! To discover more about our revolutionary system, please do not hesitate to get in touch. Our team has the expert knowledge required to offer insightful and helpful advice about any of our products. This means you can get all the details you need to be sure that Theravent, or anything that we sell, is right for your individual needs. All snorers and sufferers of sleep apnoea are different, which means that what works for one person may not have the same impact on another. Talk to one of our helpful and friendly staff today by picking up the phone and calling us on 1300 76 72 79. We will be happy to discuss your needs and help you make an informed purchase. You can also use our contact form and we will get back to you as soon as we can. With all new treatments, it is important to start the right way and develop good habits. Theravent nasal strips is comfortable, but it is still something new on your nose and can take a little while to get used to. Allow yourself time to adjust to the feeling of using Theravent. For most people, this will only take a night or two while others may take up to a week. If at any time using Theravent you become uncomfortable, simply remove the device/nasal strip and use a new one the next night. Theravent should be applied just before going to sleep to clean skin for best application. With Theravent in place you'll breathe in normally and then feel a gentle resistance as you breathe out. This resistance is Theravent beginning to work; and you’ll hardly notice it's there after a few nights! Theravent has been created with comfort and functionality in mind, which means it has undergone rigorous testing to ensure it is easy to use and the majority of people will barely even notice they have anything there after a few applications. This is why it is renowned as a top-quality treatment and becoming the leading name in snoring and sleep apnoea treatment. These nasal strips are non-invasive, simple to apply solution that virtually anyone can use. Step 1: Remove the adhesive strip from packaging and peel off paper backing. Step 2: Align the device/ snoring strip so that it is centered on the nose and both nostrils are completely covered by the mesh area. Step 3: Apply the adhesive gently against the nose to create a secure seal. Step 4: Breathe in and out of your mouth for maximum comfort as you are falling asleep. Once asleep, you will naturally switch to breathing out of your nose. Easy to use but takes a few nights to get used to. Worth preserving though as it works a treat to stop snoring. These nasal strips are easy to use. I wake up much more refreshed. Easy to use - and re-use! I was recommended Theravent by our chemist, finding Provent's pair of patches too difficult. It DOES work for me, a 'moderate' and occasional snorer, which keeps my wife happy! If a new patch is put on each night, the daily cost is not light - but I find that, if put back on the backing when not in use, each patch can be used 3-4 times before a 'leak' develops. Which gets in into what I can afford! From day one these Theravent strips made a difference for me. I have been using them every night for about six months. I am very impressed with the service from Homemed. When ever I order online they process the order by the next working day and they post them immediately. I tried a few different products but these work the best. I have been using Theravent Nasal Patches for 5 weeks, I am waking up refreshed and can get through the whole day without feeling tired. Will continue to use this product. I was recently recommended Theravent nasal patches after a sleep study. My partner has noticed a significant difference in my snoring, it's stopped completely! I feel more rested when I wake and have more energy during the day! I'm unsure if the product really works, at this stage. I've yet to go back for my review with Snore aust so won't know until then if they help or not. I also find them very expensive and wonder how a lot of people can afford them. I know myself, that when I finish work, I will not be able to afford them on a pension and wonder what I'm to do then. I've always been a restless sleeper so I think the is coming off during the tossing and turning, face on pillow etc. It stayed on the first night and hubby reported an improvement however. Just need to get it to stay on! Using a hole punch I have enlarged the exhale hole to 6mm. I have found resizing the hole still keeps my airway open without stifling my breathing too much and most importantly stops me from snoring!